Tutor Perini Corporation, a leading civil and building construction company, announced today that its subsidiary, Tutor Perini Building Corp., has been awarded a contract by Wurzak Hotel Group and DoveHill for construction of a dual-branded Tribute Portfolio and Element by Westin Hotel in downtown Fort Lauderdale. The contract value was not disclosed. 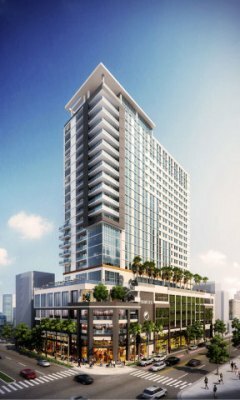 The project scope of work includes construction of a new 24-story, 323-room hotel to be comprised of a 209-room Tribute Portfolio Hotel and a 114-room Element by Westin Hotel within the same structure. The upscale building will feature a rooftop lounge and restaurant, a pool and gymnasium facility, parking within the building, ground-level retail spaces, a ballroom and several meeting rooms. This project is one of several significant regional developments planned as part of the revitalization and modernization of the Ft. Lauderdale area, and is expected to bolster economic growth. Pre-construction is currently underway and construction is expected to begin in the spring of 2016 with substantial completion expected in the fall of 2017. The contract value is expected to be included in the Company’s reported first quarter backlog. The Wurzak Hotel Group (“WHG”) is an award winning Philadelphia based owner, developer and operator of premium branded, full-service, extended stay and focus service hotels. WHG has over 35 years’ experience in developing and managing hospitality assets with a core expertise in full service hotels and food and beverage outlets. The team at WHG is led by Howard Wurzak and Jake Wurzak, and has gained notoriety for attention to operational details and a concentrated focus on customer service and an outstanding guest experience. WHG’s developed properties include Sheraton Valley Forge, Hilton Philadelphia City Avenue, Homewood Suites Philadelphia, The Westin Mount Laurel, Home2 Suites Philadelphia and other properties that are currently under construction or in development. For more information, please visit www.wurzakhotels.com. DoveHill is an independent investment platform that invests and develops Wurzak Hotel Group projects.